There are terms like "white wine weather" and "red wine weather" just like there are terms like "boat shoes" or "dancin' shoes" these are erroneous terms. There's just shoes and there's just weather, and like my good buddy Charles Gardiner says, "all weather is good weather." The point I'm trying to make is that while we're clearly in the midst of some mixed up weather, you can drink whatever you want, and frankly you can wear whatever kinda shoes you wanna wear. While it's Autumn, it's dark, dreary, and cold we're pulling out a Sauvignon Blanc for this week's Friday Find. Thanksgiving is on the horizon and we need to find some wines that pair well with America's most gluttonest day, which given the amount of gluttony we see, that's impressive. A Sauvignon Blanc is a perfect set up for so much of what you'll get fat on come Turkey Day. The Chinook Sauvignon Blanc is a perfect example of a food friendly Washington white wine. The acidity, balance and crisp bright palate will pair up well with both your turkey and the greasier sides like green bean casserole that you know you love. At least you'd love my green bean casserole, I make the cream of mushroom soup from scratch, believe dat. 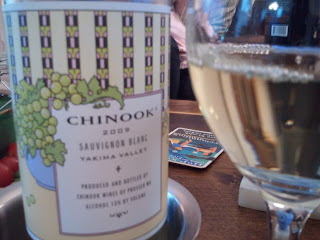 Anyways, this Sauv Blanc is made in a style I'd liken to New Zealand style Sauv Blancs. The aromatics are crisp and bright with wild flowers and grasses. The palate is less fruit forward, though the fruit is certainly present braced behind stony minerality and cut straw. $16.